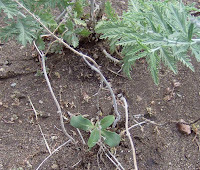 Some plants like sunflowers, marigolds, and snap dragons which are supposed to be rabbit resistant are still vulnerable when they are seedlings. I don’t want to wait until my flowers are a foot tall and flowering before I put them outside, so I have developed a few tricks. Once the plant is big enough, strong enough, prickly enough or stinky enough, I remove the protective container. Since my rabbits do not like Russian Sage, I plant a sunflower seed close to the plant and surround it when it is most vulnerable with the dead branches of the Russian Sage (they retain the smell). Once the sunflower is about a foot high and has developed a thick coat of fuzz the rabbits won't touch it and I can remove the dead branches. I also plant many of my flowering bulbs in close proximity to my Russian Sage and scatter dead sage branches around my flower beds in the spring. The paper on this Emerald Queen Norwegian Maple prevents the rabbits from gnawing on it in the winter. To do this cut a piece of 18 inch paper, 4 inches longer than the circumference of the tree. Wrap the paper around the tree, overlap by at least an inch and tape it closed. I make my own rabbit repellent, but it needs to be reapplied after precipitation. Using frugal, semi-permanent protection from the rabbits ensures that I don’t lose all of my flowers after every rain shower! Do you have to contend with rabbits or other pests in your yard? How do you protect your plants? Please share your ideas or links in the comment section. To read about more frugal tips, visit Frugal Friday. I didn't know that about Russian Sage. I haven't had a problem yet with rabbits, but if I do, I'll know now what to do. I have a little bit of Russian Sage. Maybe I should get some more. Thanks for sharing. The only annoying critter I have is a ground hog. He doesn't bother my plants. He just makes my lawn look like you-know. The best thing to do is flush his tunnels with water. But he sometimes comes back again and again. Oh, well.